The Spoonflower Quick-Sew Project Book: 34 DIYs To Make The Most of Your Fabric Stash had me at quick. I admit the word ‘sew’ sends shivers down my spine but when I peaked inside Anda Corrie’s new book I was pleasantly surprised to find several projects that even this self proclaimed non sewing fan could conquer. Just because I don’t enjoy sewing does not mean I don’t have a massive fabric stash to bust through. When Spoonflower asked me to be a part of the book launch I was super pumped to finally play around with turning Jennifer Perkins Art into Fabric (keep an eye out for wall paper, wrapping paper and more coming soon). 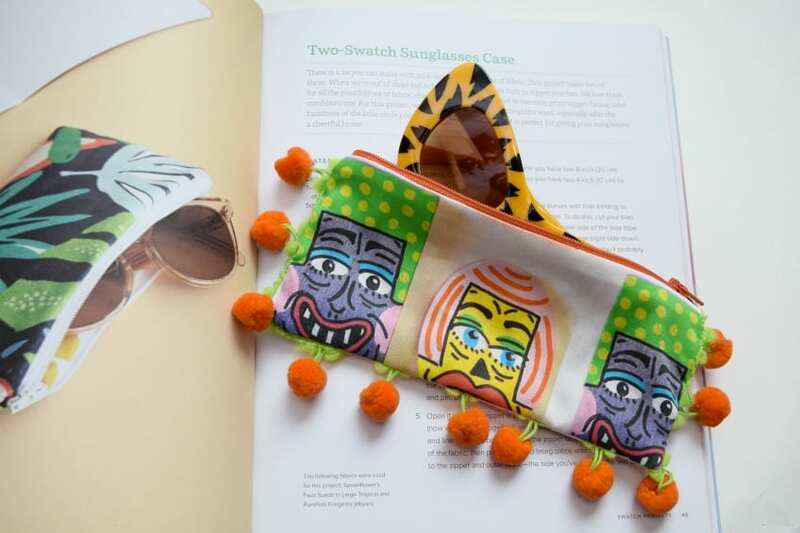 The Two-Swatch Sunglasses Case project from The Spoonflower Quick-Sew Project Book was perfect to test out my first adventure into creating a fabric line. The instructions and pictures make everything easy to follow. Remember these are quick-sew ideas so nothing inside the book is overly complicated. Anda Corrie has curated some adorable projects ranging from home decor to baby bibs all using fabric available from Spoonflower. Yup, all you need fabric wise for this project are swatches. Easy right? I thought so. Just add zippers and obnoxious pompom fringe. 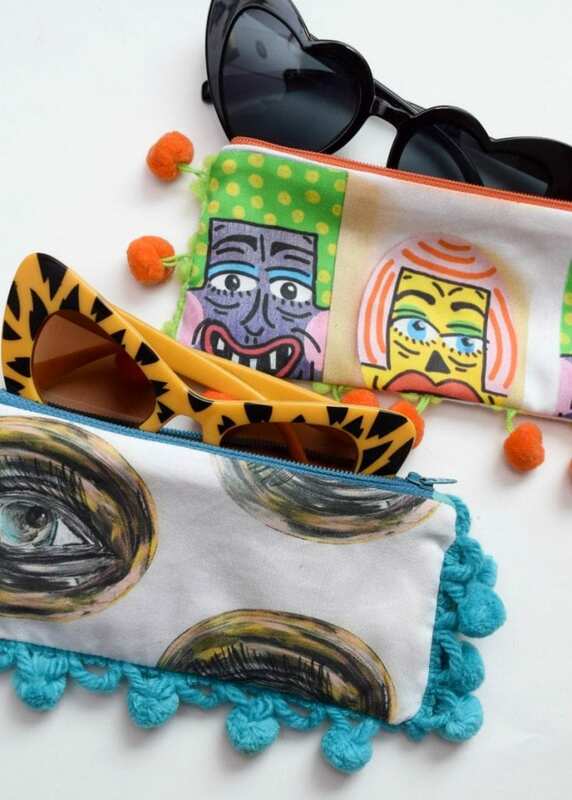 Yup, even sunglass cases are better with pompom fringe. Duh. You can order just a swatch from Spoonflower of any fabric in several different weights. The Spoonflower Quick-Sew Project Book has an entire chapter dedicated to swatch projects. 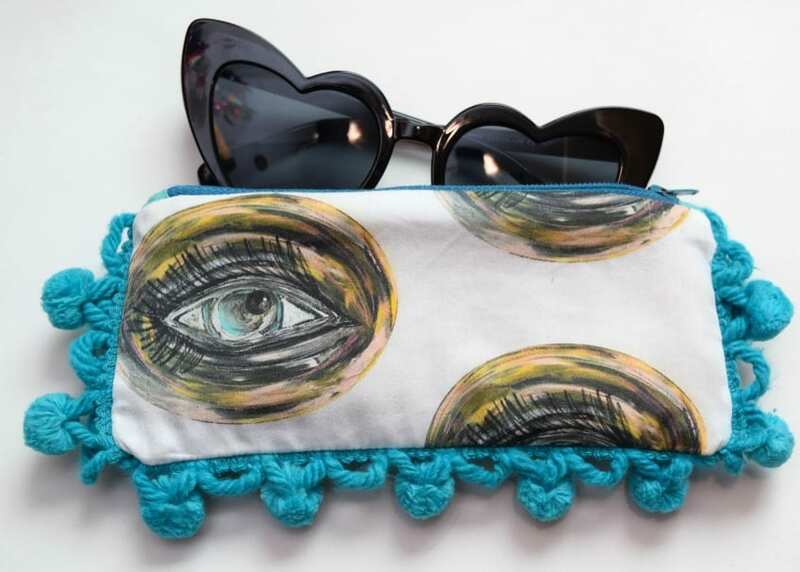 Try your hand at not just a sunglass case but also bean bags, a tiny circle purse, coasters and more. I can’t decide if I like the case with the Eye See You Fabric or the Weirdo Dance Party better? Luckily I have a LOT of sunglasses in my life so I can never have too many cases. Crafty Shades – Sometimes the future is so bright you gotta wear DIY crafty shades. How perfect would these look in your DIY sunglasses case! Felt Sunglasses Case – No sewing, just gluing – my favorite kind of craft. Specs Appeal – No case necessary for this cutie because you break your glasses and wear them! But Wait! There are No-Sew and Low-Sew Projects Too! Not just sunglass cases there are even NO SEW projects, or low sew at least inside the book. My very favorite kind of project. Covered button ideas, iron-on patches, jersey fabric yarn and pincushions. So even if you have never threaded a needle there are projects for you inside of The Spoonflower Quick-Sew Project Book. The book has patterns, spotlights several different Spoonflower designers and TONS of gorgeous fabric options. 10 Covered Button Crafts – I love me a covered button project, check out a few of my favorites! DIY This With Jennifer Perkins: How to Make T-Shirt Yarn – I just did an episode all about jersey fabric yarn. Recipe Tin Pincushion – Once you learn the basics of making a pin cushion, sky is the limit as to what you can put it in! 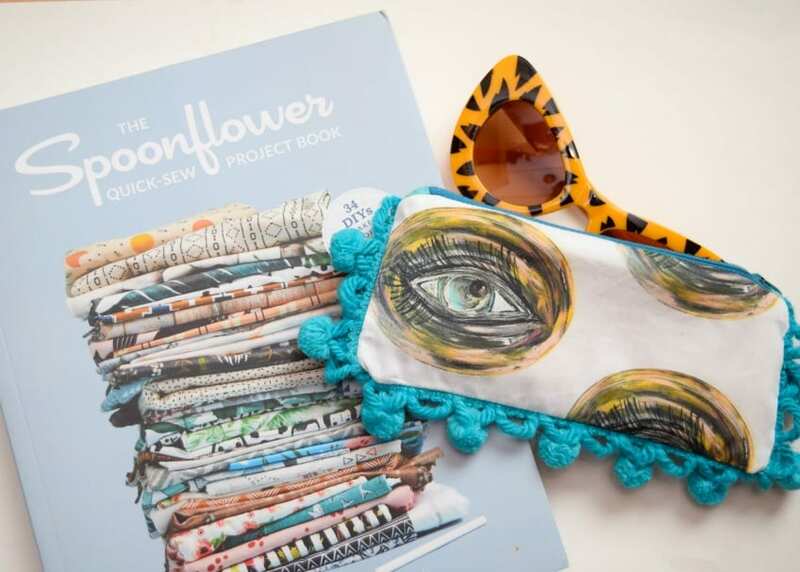 Wanna try your hand at some of the projects in The Spoonflower Quick-Sew Project Book? I’ve got a coupon code to share with you! Use the code QuickSewJen10 for 10% off fabric, wallpaper and gift wrap. You don’t even have to use it on my Spoonflower fabric designs, but it would be extra cool if you did then sent me a picture of the project! The offer is good through December 31, 2018! Also, be sure to follow Jennifer Perkins Art on Etsy and Instagram for more weird pattern fun! Posted October 9, 2018 & filed under Books, Crafts, Wearable Crafts. Those are so flipping cute! I love them and how great is it that you could reach into your purse and know exactly where your glass case is because you trimmed it or its fabric and your other cases are a different material. These are so cute! Thank you for sharing at Party In Your PJs!